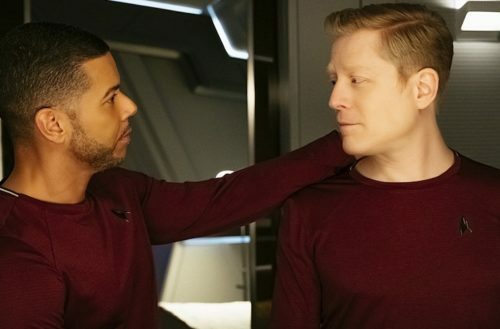 Earlier this fall, the CBS sci-fi series Star Trek: Discovery made history by unveiling the first-ever openly gay characters in the 51-year-old Star Trek franchise. This week, Star Trek: Discovery made even more history by showing the first-ever Star Trek gay kiss by having the couple kiss during a dramatic scene in the most recent episode. 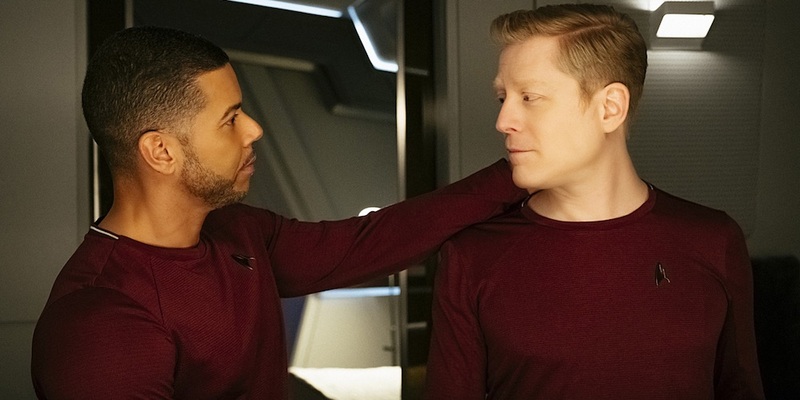 The kiss involved Lieutenant Stamets (played by openly gay actor Anthony Rapp) and Dr. Hugh Culber (played by openly gay actor Wilson Cruz). Here’s some background for those of you who haven’t been watching. For most of the season, Stamets has been researching a special type of spore that makes quick travel across the universe possible. In order to better understand it, Stamets injected himself with some of the spores, an experiment that seemingly changed his personality and allowed him to experiment with the unstable teleportation method. As a medical officer, Stamets’ husband, Dr. Culber, somewhat disapproved of Stamets injecting unknown pathogens into his body. But after a physical exam, it seems like Stamets is doing okay — and is happier and more personable overall, something that seems like a plus, but might actually hint at him being fundamentally changed in a dark way. Anyway, at this point in the show, the entire crew is being threatened by a fleet of Klingon (warring alien) ships that are hidden from detection by a cloaking device. In order to discover the fleet’s position, Stamets must complete 133 “consecutive micro-jumps” (teleportations) around the assumed position of the Klingon fleet in order to help his crew detect the enemy ships and destroy them. But because spore-based teleportation is a relatively new scientific field, this task is dangerous, leading Stamets and Culber to share a dramatic kiss before Stamets begins his task. And let’s not forget the other historic Star Trek gay kiss…. While the kiss only lasts 10 seconds, it’s still a major first. Star Trek’s first and only lesbian kiss occurred in Star Trek: Deep Space 9, Season 4, Episode 6 nearly 22 years ago. And though it’s not a gay kiss, the original Star Trek series featured the first interracial kiss on television. In the 1966 episode “Plato’s Stepchildren,” Captain Kirk (William Shatner) kissed Lieutenant Uhura (Nichelle Nichols). NBC wanted to shoot two versions of the scene — one with the kiss and one without. However, whenever it came time to shoot the kissless version of the scene, Shatner would purposely make mistakes, forcing NBC to use the version with the kiss.